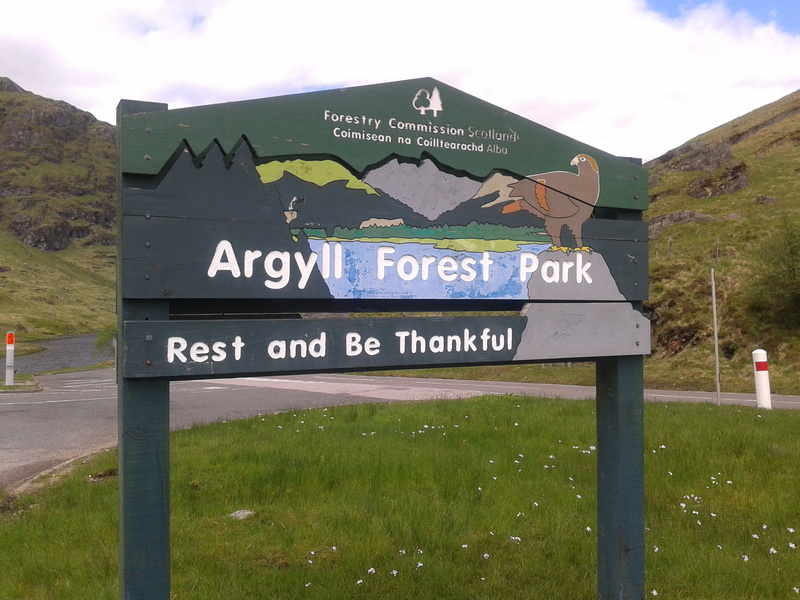 ‘Rest and Be Thankful’ in Argyll, Scotland. I would never normally comment on world events on this blog, but I feel like today is different. Today – well actually about 7am this morning, when Husband stumbled into our bedroom to tell me the news, even though I was still half asleep – the world changed. Just a little bit, but it changed. Significantly. The Scots voted ‘No’ to independence. Most people on the planet are probably blissfully unaware of this little morsel of news. Here in the UK, we have had weeks of coverage, and in the last few days, it has been continual. Which has been a bit frustrating for those of us south of the border who didn’t have a vote. Nevertheless. dear reader, you are probably wondering why a nation of around 5 million people voting for no change actually changes the world significantly. Because in a country where voter apathy is endemic, and in which some elections only manage to raise 10% of the electorate from their armchairs, the Scots managed a dazzling turnout of 85%. This included sections of the population who had never been engaged by politics before, including teenagers. What is more, there are few, if any, other places in the world where a mother parliament would willingly allow one of its subordinate states to vote freely and fairly on whether to opt out of the Union, and then respect the result. I wish you a happy and free weekend, one in which you are free to create as your conscience dictates, without political censorship. 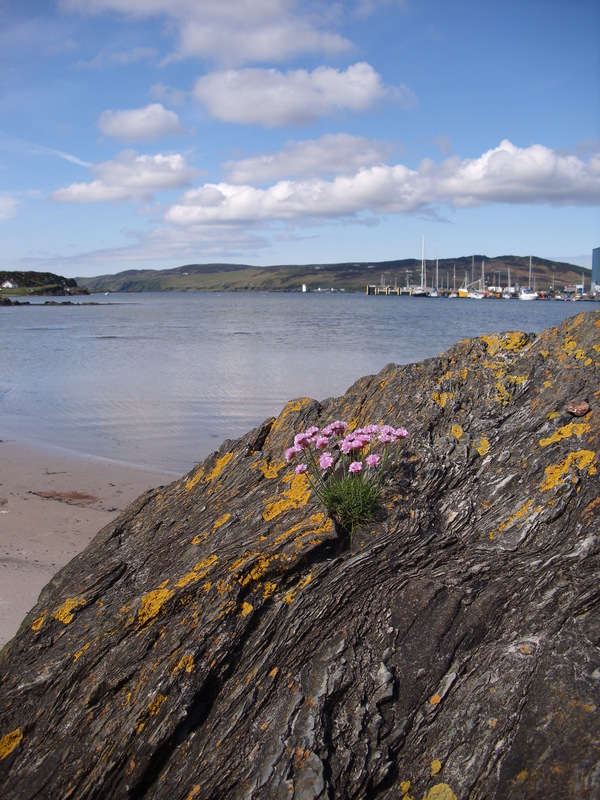 This entry was posted in Freedom to be yourself, Inspiration, My Life, Scotland and tagged democracy, freedom, Independence, Scotland on 19.09.14 by evenlode1967. GalGael carver – I am mortified to think that I never got this lovely man’s name. But my talk with him will linger in my memory always. Now, you’ve heard me banging on before, probably ad nauseum, about how CREATIVITY HEALS. Now here is the proof. 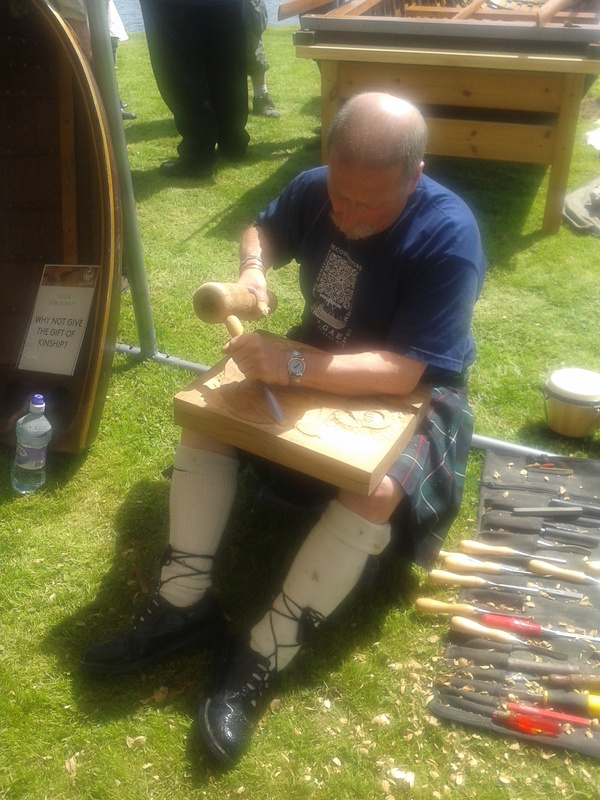 GalGael is a charity which teaches people in difficulty ancient skills such as carving, boat-building, spinning and weaving, and by doing so, gives them a chance of a new start in life. So says their website, and I have seen the proof. GalGael is supported by the whisky distillery Lagavulin on Islay, where we recently had our holiday, and I met some of the craftsmen and women they have trained there. Producing beautiful carvings in the ancient styles of the Norse and Celtic races whose cultures come together in native Scottish arts, these men and women are making gorgeous, tactile and useful works of art, working with natural materials, getting in touch with their national cultural history, and and crafting new lives for themselves in the process. Lagavulin supplies old wood from nolonger wanted casks, which GalGael make into covetable furniture and home goods. Each item has its own charm and idiosyncracies, both from the craftsman who made it, and from the varied history of the wood itself. I had the privilege of chatting at great length with one of GalGael’s fine representatives (pictured above), himself a survivor of the worst storms of life. As we talked about the Celtic and Norse myths that lay behind his carving, and the pleasure of making something with one’s own hands, I learnt a lot about the personal story of this proud man, nolonger bowed by his suffering. He attributed his renewed joy in life and self-respect to what he had learnt at GalGael, and I felt honoured and touched to have met him. 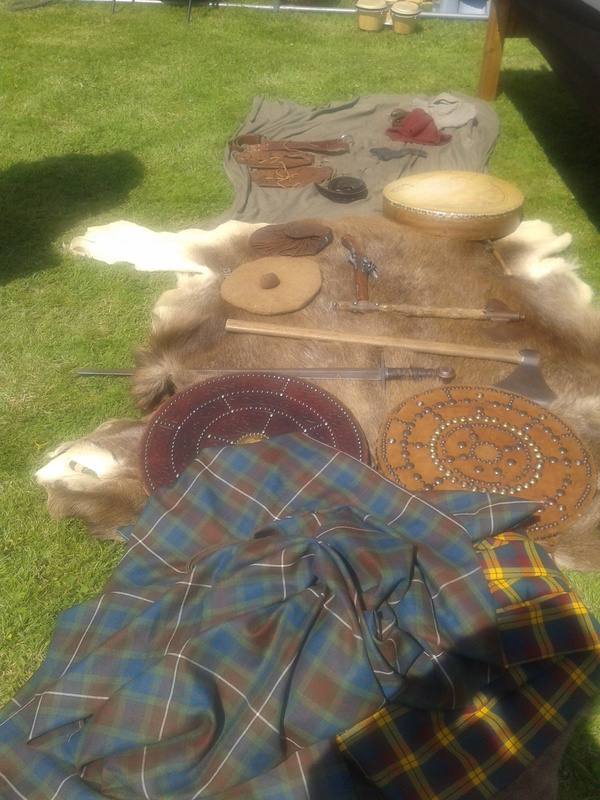 Handmade Scots artifacts reproduced by the craftsmen and women of GalGael. GalGael is living proof that creativity saves lives. I’ve been through a few storms myself, and have learnt through practise that it really works, but nothing brought it home to me like seeing these wonderful people talking so enthusiastically about their work and how it had helped them survive the worst that life can fling. If you are going through a storm yourself right now, I encourage you to have faith in some act of creation that you can undertake. Make something, however simple. It doesn’t matter if its not any good in your eyes. We all have to start somewhere. Try. Practise. Lose yourself in the flow of making. In the Charm of Making. And it will heal you. You can learn more about the wonderful work this charity does through their website, where you can also buy their goods and make donations. And you can get more inspiration for your own work from their creativity and their hope. This entry was posted in Creativity, creativity heals, GalGael, Healing, Inspiration Monday, Myths, Scotland and tagged carving, Creativity, creativity heals, GalGael, Inspiration, Islay, Islay Whisky Festival, Scotland, traditional crafts on 09.06.14 by evenlode1967. Iain Banks, The Crow Road, Scribners 1992. Surely, this is the greatest first line of any novel since Jane Austen’s ‘Pride and Prejudice’, and Orwell’s ‘1984’. He introduced me to a Scotland that I fell in love with, and to a way of writing that is spare, funny and insightful. He was extraordinarily productive and his work covered a wide range of subjects, genres and styles. When you opened a new Banksie novel, you never knew quite what you were going to get next. If you want to read the best of Banks’s literary fiction, I recommend ‘The Wasp Factory’, ‘The Crow Road’, and ‘Complicity’. I can’t comment on his science fiction, for which he was also justly famous, because I never managed to get through one. Space operas aren’t really my thing. But as I have said before, his ‘Raw Spirit’, a book about whisky, driving, Scotland and being a writer, is one of the most charming I have read. It is sad that a writer so talented and prolific has been taken from us so young, but why am I writing about this? Because Banksie was a writing hero of mine, that’s why. A writer I admired and wanted to emulate. Like Virginia Woolf, his photograph hangs in my study to inspire me. He taught me that protagonists don’t have to be likeable, and that little memories from growing up can serve as icons of our internal psychology. He taught me that you should keep at it, and write what you love. And that it’s okay to be funny, and a bit geeky. Who are the people that inspire you? Whose work do you seek to emulate, or admire? Whose biography have you read for a better understanding of the creative process? Who are your artistic heroes? These people are your creative ancestors, and you must always acknowledge where you come from. Take time in your notebook to name the people who inspire you, whether it is their life struggle from which you take courage, as I do with Woolf and Frida Kahlo, or their creative process which fascinates you. Perhaps it is their politics, or religious faith you admire, or their down-to-earth attitude. Perhaps it is simply the creative work they produced. Whether your hero is Steven Spielberg, Gandhi, Maya Angelou or Picasso, explore what they mean to you, what their example says about where you want to take your art. This entry was posted in Creativity, Freedom to be yourself, Heroes, Iain Banks, Inspiration, Inspiration Monday, Notebooking, On Process, Outflow, Self Reflection, Virginia Woolf, Writing and tagged Creative heroes, Creativity, Crow Road, Frida Kahlo, Iain Banks, Inspiration, Raw Spirit, Scotland, Virginia Woolf, Wasp Factory on 10.06.13 by evenlode1967.